Children, don’t forget to come in own clothes tomorrow; staff will be ‘dressing down ‘ for the day. All money raised will be entrusted to our Year 6 children, who will research what the greatest need is. We will then buy the supplies and send them with the friends of Miss McLoughlin, who are travelling to Calais. Thank you for your usual kindness and generosity. What a wonderful day we have all had here at our fantastic school! 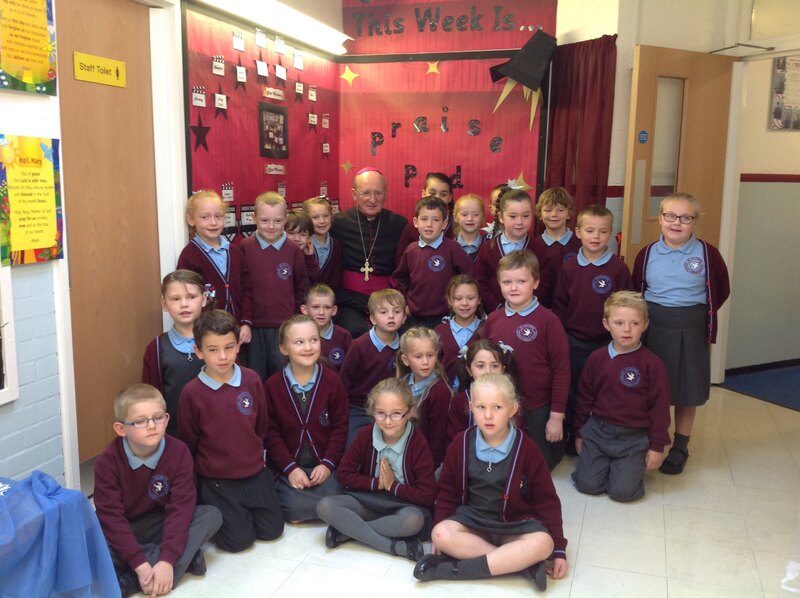 We have had the privilege of welcoming Bishop Tom Williams to our school this morning. He visited every class, from Nursery through to Year 6 and then finished the visit by having a delicious lunch with us. The children sang,prayed, painted, played instruments and Year 6 even planned and presented their own Collective Worship! Bishop Tom opened our brand new ‘ Praise Pod’ and was the first person to use it. The staff and children would like to thank him for being a very special guest.We would also like to thank Fr Chris for coming along too. I would personally like to thank our children and extremely hard-working staff for making the morning so special; I am incredibly proud of all of you!